Uneven skin tone is a common problem for many women, and if not addressed at early stages can lead to bigger skin damage over a longer period of time .The cause is over production of melanin and if you expose your skin more in the harsh sun, then its gonna show up and we don't want that Right? 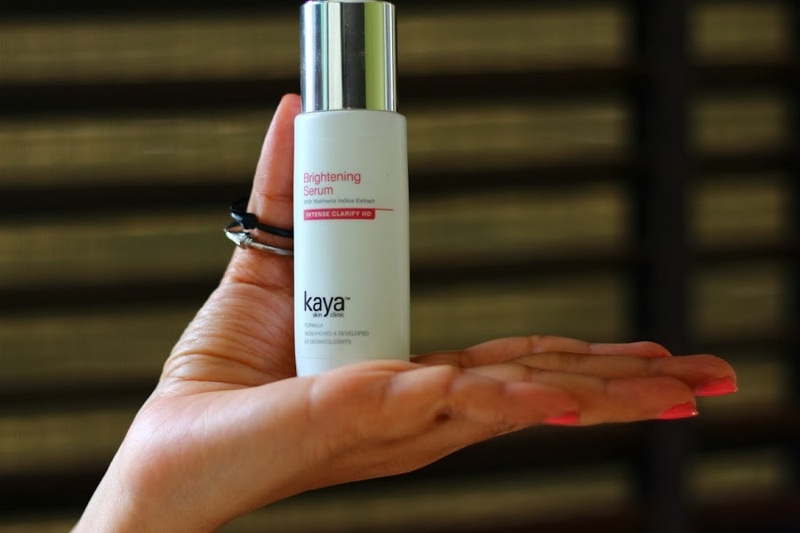 A few weeks back I was sent this bottle of Brightening serum with Waltheria Indica Extract by kaya Skin clinic .This Potent active Skin lightening complex is known to even the skin tone, lighten freckles and age spots as well as tends to reduce hyper pigmented areas. How to Use- Just 2-3 drops on a cleansed face and then follow the moisturizing or make up routine. Texture: Non fragrant, Non gooey and absorbs rapidly in the skin. Packaging- This comes in a Pretty dropper Bottle to dispense just the right amount we need and I quite like this kind of packaging. The best part is that we can re-use these bottles. The Result- I have a Normal skin, and my problem area is my fore head which shows signs of discoloration. I have been using this product for over 15 days and didn't expect an overnight miracle but was anticipating a brighter and healthier looking face at the end of it. Not gone through even 1/4th of the bottle yet but am amazed how this serum is working for me ! My skin looks way more clearer, lighter and softer and I only use a tiny bit.It keeps my skin looking nice and good when its On. There is a difference in the way the sun spots on my forehead looked earlier and now. Not a facelift kind of a product But the thing is I do not have to use extra to conceal the spots, just the regular sweep of foundation covers well for me. Price/Availability- MRP Rs. 1490 for 30 ml Available at all Kaya outlets. Overall Rating- 10/10 and definitely a keeper for me . WOW..looks like a cool product. Would love to try it out, though I find it a little out of my budget. Great review, would be on the look out for it. Lovely review. Anyways, i followed you via GFC i hope you'll do the same.